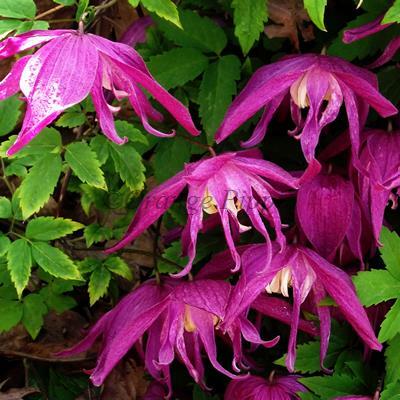 A beautiful early-flowering Clematis which will add spectactular colour to the garden or patio during the spring. Clematis 'Ruby Celebration' produces masses of lovely double ruby flowers with a yellow and white centre during March, April and May. Clematis 'Ruby Celebration' was raised and named by John Richards of John Richards Nurseries Ltd, Colwall, England in 2012-13. This non-evergreen climber can be planted in the garden, trained up a trellis, garden wall, fence, pergola, or planted in a container with bamboo canes or an obelisk for support and placed on the patio, making it suitable for the smaller garden as well.